Will Alikiba Perform at Diamond Platnumz's Wasafi Festival? 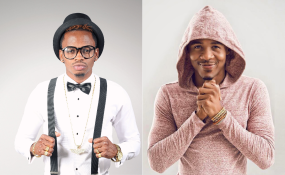 Have Tanzanian Singers Diamond and AliKiba Buried the Hatchet? Bongo flava artists Diamond Platinumz (left) and Alikiba. Bongo flava heavyweight Alikiba has made a surprise response to his nemesis Diamond Platinumz's plea to be one of the performers in the upcoming Wasafi Festival. Diamond had on Monday sent out a special request to Alikiba to participate in the inaugural Wasafi Festival in Mtwara set for November 24. He dispatched one of his managers Sallam to reach out to Alikiba's management to see if a deal could be struck. The two camps are understood to have struck a deal despite fears that Alikiba would turn down the request due to their rivalry that has lasted over a half a decade now. Alikiba has stated that he is ready to be part of Wasafi Festival, but as a sponsor and not a performer. If the sponsorship offer is accepted, Alikiba will sponsor the event through his energy drink brand MoFaya that was launched in April. "Baada ya subra ya muda mrefu hivi karibuni nitawatangazia bidhaa yetu pendwa ya Mofaya inapatikana wapi na kwa kiasi gani. Pia ndugu zangu Wasafi tumepata salamu zenu, nashukuru kwa mualiko wenu ila bahati mbaya sitoweza kushiriki kwa sasa kutokana na majukumu ya kuzundua Mofaya katika nchi zingine. "Hata hivyo tusingelipenda kuwaacha hivi hivi, tupo tayari kuwapa support kwa kudhamini tamasha lenu kupitia MofayaEnergydrink ili kuweza kusukuma mbele gurudumu la maendeleo ya sanna yetu Tanzania na Africa," Alikiba issued a statement. He went on to note that his management RockstarAfrica will keep engaging Wasafi in actualizing the partnership.